Cost of Nonconformance and ROI for Training Projects _ASTD – 1991 – 9 page PDF of the original (not the published version) article submitted and published in ASTD’s Technical & Skills Journal in their May-June 1991 issue under the title: Costing Out a Training Project (which it did not address). This presents an alternative approach for determining ROI that was unique to one of my client’s situation, and proxy for ROI: RONA – using the quality concepts of Cost of Non-Conformance and the Costs of Conformance in place of returns and Investments respectively. And to calculate ROI we’ll use two numbers – the CONC: Cost of Non-Conformance – which are the costs or values for problems/opportunities – and we’ll use the COC: Cost of Conformance – which are the costs for getting the problem/opportunity addressed/resolved/etc. To get your training/ learning/ knowledge management projects funded, you need to be able to state both what it will cost and what it will deliver for the investment in terms of increased or better performance, and then compare the two figures. If you were the single shareholder for your Enterprise this is how you would want this approached! If you and your colleagues have ever lamented over your management’s failure to fund the training effort adequately, you should stop to consider whether or not you have been attempting to sell them using the business terms that they are familiar with or the training terms with which you are familiar. No one cares about Learning Objectives – they care about Performance Objectives. It’s not about Learning!!! And don’t even get me started on why we insist on slapping the Learning label on anything Web 2.0. Give me a break. These are for fun or function and one will learn something using them just as one would learn something from climbing a tree or swimming across a lake. Why is about us – Learning – rather than “all about” our clients and stakeholders who see learning as a necessary means to the ends of their performance competence requirements? You know – the ability to perform tasks to produce outputs to stakeholder requirements. 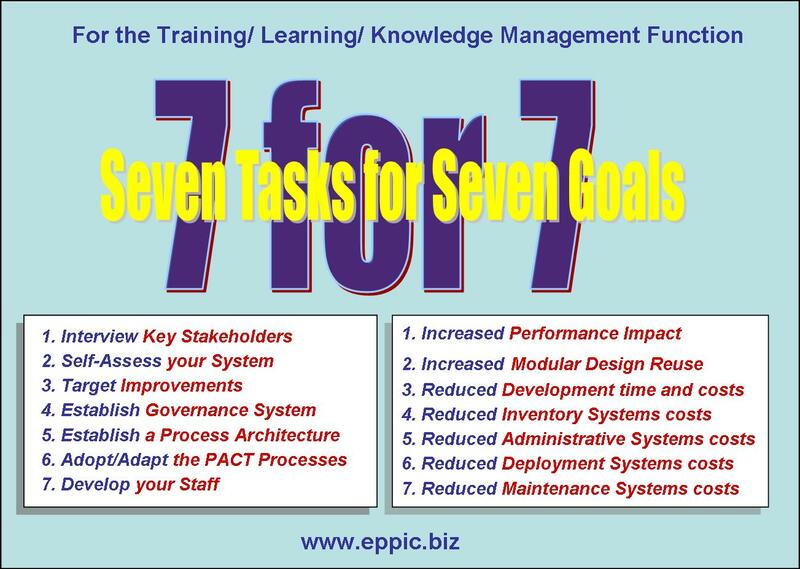 Performance-based learning/training/knowledge management systems and content enables. These web 2.0 tools are performance tools, as in Enterprise Process/Workflow Performance tools. Don’t call them Social Networks and expect the CEO to get excited. Call them Performance Tools and you might get your 30 second elevator speech in about ROI for Web 2.0. We in training have a tendency to expect everyone to learn our jargon, and then we complain when no one will listen to us. We need to learn how to sell our training products and services from a business perspective. We need to become business champions first and training champions second. We need to learn to think and speak in the language of business, using terms like ROI – return on investment. Management does not have unlimited resources, but they will spend their resources on a training project if it can be shown that the ROI for the training project is greater then the ROI for other potential investments. You and your training project are in competition with all other investment opportunities of your Enterprise, including hiring additional personnel, buying machinery, developing computer information systems, or discounting the prices of the company’s products and services. You need to prepare a business case that fully justifies the expenditure of corporate resources on your training project because it is a wise decision, not because training is the morally correct thing to do. Find any business case that was successfully used in your Enterprise and model your after that. Ask anyone in Finance to review your math. The CONC is the dollar value of the difference between 100% proficiency and the current level of performance proficiency. To the advocates of performance technology guru Thomas F. Gilbert, this is the same as the PIP – performance improvement potential. Because of the high-value visibility of the quality drive represented by Six Sigma and Lean (although Lean efforts should always go first), I suggest that you begin to use quality, productivity, and financial terms rather than performance technology terms when talking to or selling to your customers or management. Performance technology already embraces all of the same concepts—we just use different labels, and that’s all we’ll have to give up! But we will have to translate our concepts, methods, tools, and results to the language of our customers-business terminology. 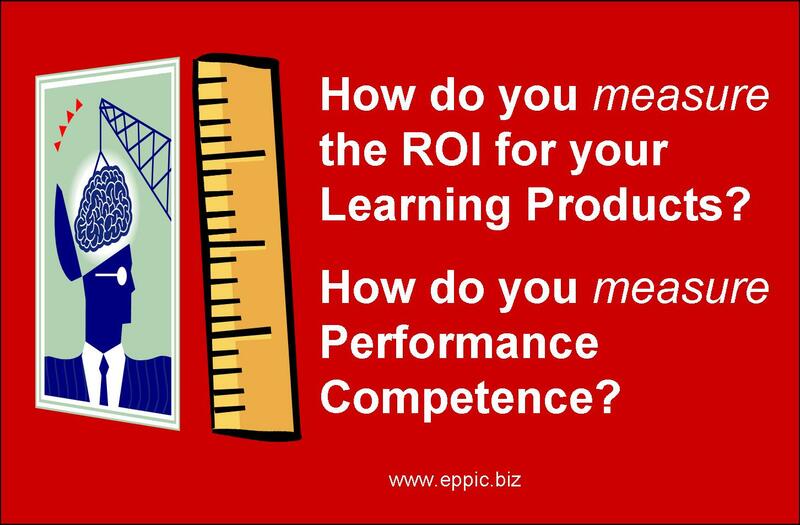 To use the quality/productivity concept of CONC, we need to be able to calculate the ROI for bringing performance in line with standards where the CONC gets as close to zero as practical. What is the ROI for eliminating or reducing the CONC? To determine the return on investment for a training project intended to minimize or eliminate the CONC, we must look at the existing performance at which our training is targeted. • Where is it at now? • How much can it be realistically improved? • How much will it cost to fix it? The CONC value, stated in dollars, is used within the ROI calculation in place of the return value. In its most simplistic view, calculating a CONC value requires two elements. Some jobs are easier to quantify and as a result, it’s easier to assign a dollar value to the difference between the actual and potential performance. Salespeople generate sales revenues in dollars. Widget assembly workers produce a number of widgets at fairly definable labor, material, and overhead costs. A singular focus or a highly repetitive set of tasks lends itself to easier measurement. But for many jobs, there are too many variables and difficulties in measuring and assigning a dollar value to the performance. The elaborate measurement systems you need may not be in place, or the data you need may be hard to come by. These types of jobs could include secretaries, design engineers, managers, architects, computer programmers, materials expediters, etc. They are all somewhat problematic when it comes to establishing the dollar value of the performance. 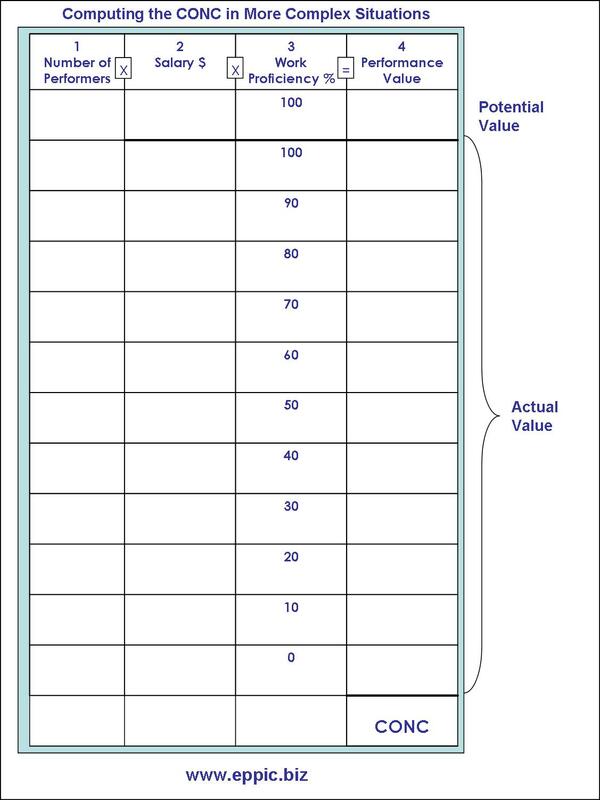 When potential value of performance is extremely difficult to determine due to the number of variables or the lack of measurement systems data, one could use the cost of that performance as the benchmark – the labor dollars that it would cost to have 100 percent work proficiency (or whatever is feasible in the eyes of your management). If we have a workforce of 100 widget workers, each earning $35,000.00 per year, our potential value is $3.5 million. This figure represents what it currently costs the organization for the potential of having 100 percent performance conforming to standards. In most companies there is only a slight difference between what top performers and average performers earn. So the cost or value of the potential 100% job proficiency is approximately the equivalent of the performer’s total wages. In our example, we have 100 performers earning a total of $3.5 million (figure below). That’s the value to your top management. That’s our benchmark. 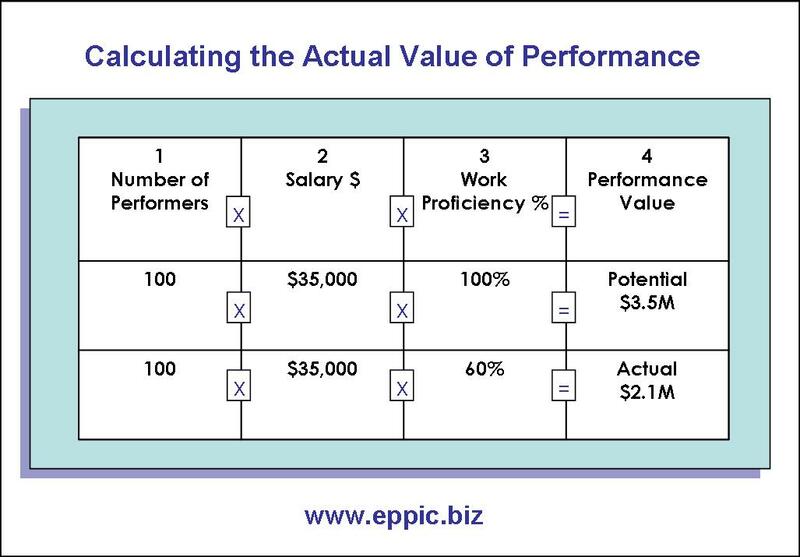 If your organization pays for performance and the better performers get paid more for their superior contributions, your calculations would be more complex. But the benchmark for comparison will still equal the sum total wages for the entire group of performers. But what are we getting for our $3.5 million? Are we getting full value, 100 percent job proficiency for it? Or is some performance proficiency slipping through the cracks? What is the actual value received for the cost of performance? What if our target audience performers were on average only 60 percent proficient? What is the CONC then worth to us? In this case, our actual value of performance is $2.1 million. So, in this case, the CONC is $1.4 million annually. That’s $1.4 million left on the “performance table,” so to speak. If your training could get everyone to perform at the 100 percent level, $1.4 million would be the return to be compared against the investment required to make that happen. If 100 percent seems too “blue sky,” then consider the results if your training can get everyone to average or 75 percent, 80 percent, or 90 percent; respectively, you would still contribute $1.05 million, $1.12 million, or $1.26 million to the corporate bottom line! That’s the resulting “return” to the organization. We’ll calculate the ROI percent later. If these additional “costs” were included, your CONC value would be even higher. The larger your audience, the greater potential CONC, making it even more worthwhile to address. These are numbers that can get your management’s attention! 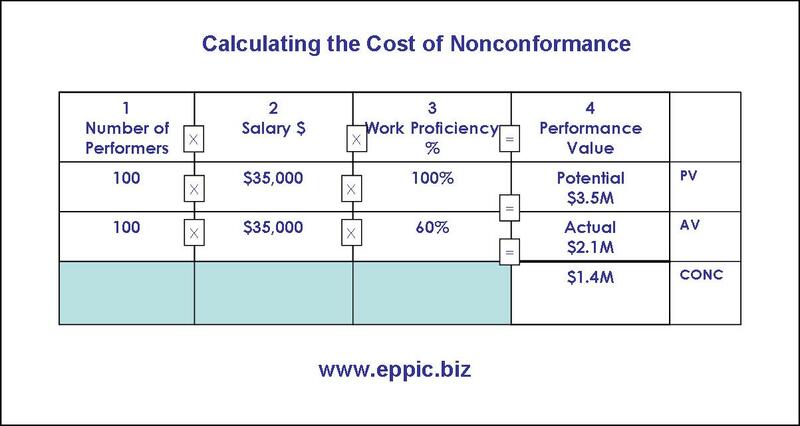 The example we used above to calculate the CONC was quite simple: one type of performer earning the same salary, performing at approximately the same level. So, what do you do when the situation is more complex—where there are several types of performers earning varied amounts of money and performing at different levels of proficiency? This chart segregates the employees in the target population into ten different levels of proficiency. This may be too much. Four or five levels may suffice. Adopt or adapt. • How many levels or classifications do you have or need for the proficiency of performance? • Is ten levels, 10 percent through 100 percent, too many or too few? • Could you use smaller increments of 25 percent? Four levels of 100, 75, 50, and 25 percent? I suggest you try four or five, but in any event, it’s your management that has to finally agree with the segmentation scheme. The goal is to make it understandable to your management. NOTE: Determining how much your organization is really getting for its salary dollars is a potential powder keg. Reputations and careers are potentially at stake. Move cautiously. It will be easier to move through this minefield if your organization has had or is expecting a major change in the business that has/will create this CONC situation. Fewer people might then be fearful of being blamed. Of course, if you have a politically “wired” project champion involved in your project from outside your training organization (i.e., a client desiring the project), you can follow their lead. To determine the potential ROI for your training project you need two estimates. 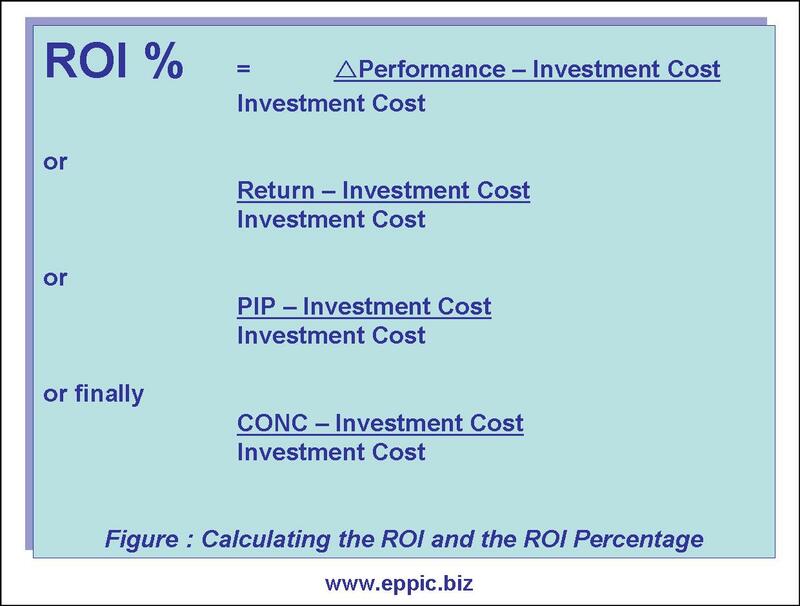 This ROI percentage can then be compared to other opportunity ROIs by top management or even by the training function to determine where to spend their limited resources. Should it be on training for a particular group, or should it be for new capital equipment or buildings? Where is the biggest bang for the buck? What would “a single shareholder want to do with their money?” Do like-wise. • What is an acceptable percentage return? • What kind of returns are management achieving lately? Of course, other factors need to be considered in the decision to allocate resources. The overall level of assurance that you can achieve your claimed potential return is something your management will take into consideration. Now that you’ve got your ROI, how do you get the organization to agree with your answers? What’s the best approach? The one most believable, even if not perfect? Well, who has to believe it? The people you’re trying to sell—your management. How can you make it believable? Have them help generate the figures that go into the calculation. If they don’t like the end result, let them change the figures again and again until it becomes something that they can believe, explain, support, and defend. Even if we in training had the absolutely correct equation, variables, and values identified, if management won’t buy it, what good is it? And if their answer doesn’t create a go-ahead for your project, maybe your project shouldn’t be done. Maybe there really is a better or more strategic use of the limited corporate resources. Your next step is to package and present the data for making that decision. Try to obtain a copy or outline of a business case that has been used within your organization. Product and service management groups found in marketing may be a good source for this. Training should never be done for simply the sake of doing training, even where you can clearly identify the need for it. It may cost more to provide the training than it could ever return to the business. There may be better investment opportunities for the organization to promote productivity improvement or product/service quality (both internally and externally) and thus contribute to the financial viability and stability of the organization. 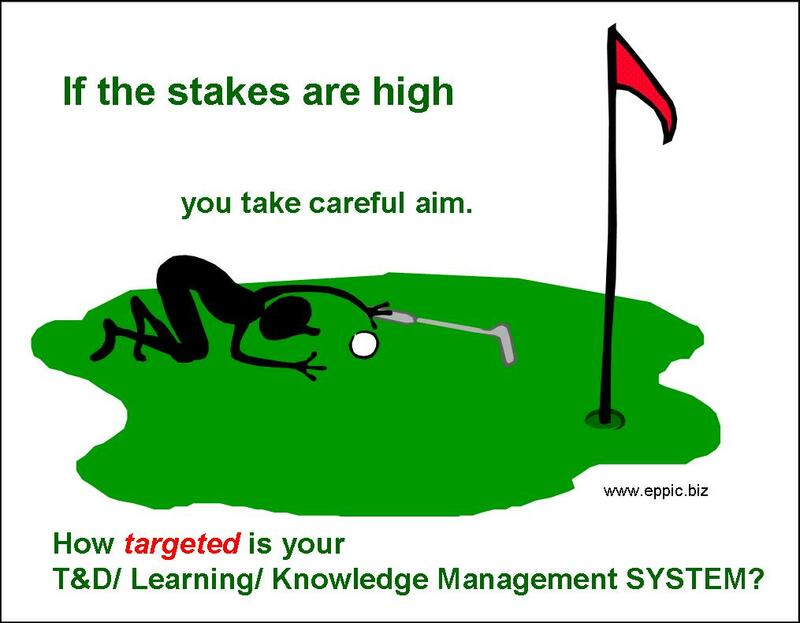 Don’t be a training or learning or knowledge management champion.